Well my son Matt came to stay for the summer and we agreed to go for a scrambe at Harmon's Cave. Gerry Roach's Flatiron Classics book said there was a lot of good scrambling in this area with six different summits to climb. 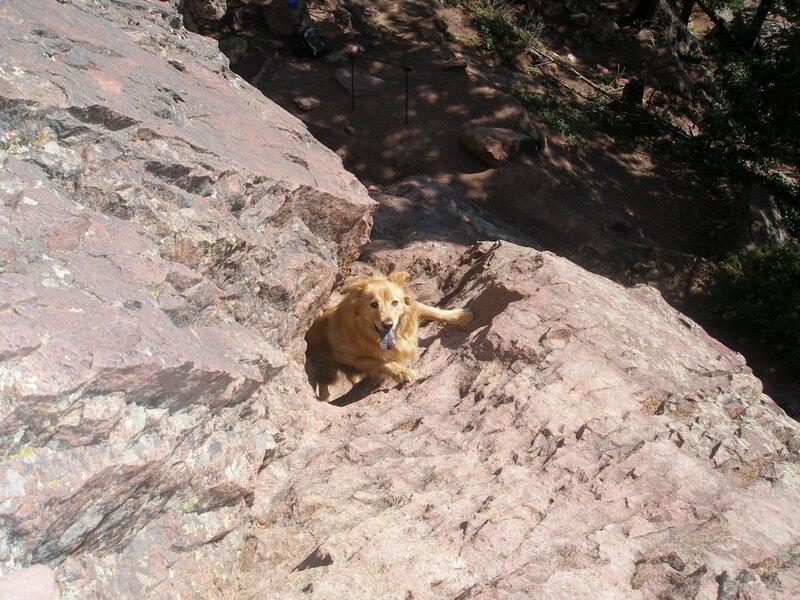 We brought Gracie along because she loves to hike and I figured she would be okay at the base with two of us there. We approached the area via the NCAR trailhead. The hike from here isn't very far and Gerry's book described the take off point well: leave the Mesa Trail 100 feet south and uphill from its junction with the Bear Canyon Trail. As we approached Harmon's Cave we found that the cave itself has an iron grate covering the entrance. Also they have closed off all climbing within 100 feet of the cave. We were disappointed, but still found plenty of scrambling without encroaching on nesting raptors. 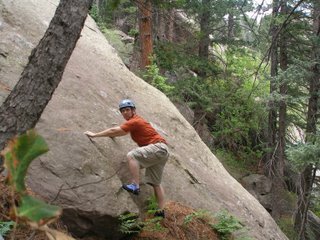 Most of the climbs are less than 100 feet so you can try many different routes and Matt and I explored them well. The arch that Gerry said you can climb thru proved too small for me. Check it out in Matt's picture. The scramble of note for the day is when we made our way to the highest summit of the six. To avoid the cave area we picked our way slowly on the ridge. The final pitch has some nice jug holds that make the ridge easy but exhilirating. On the way back to the trail we bushwacked a bit and had to cross a long expanse of scree. Not fun for Gracie! Another weekend and another chance to go hiking and scrambling in the Flatirons. This time I chose a trip to Royal Arch and a bit of scrambling in Fern Alley. I was hoping that the trail was not blocked off like on Mallory Cave. Luckily it wasn't, but much of the south side of the third flatiron is. Nesting raptors you see. As you take the Royal Arch trail from Chautauqua Park it climbs to the west and there are some great views of the Flatirons. The route thru Bluebell Canyon leads to Sentinel pass. When I started to descend from the pass it made me a bit nervous wondering if I was on the right path. Luckily I was, so don't let the descent fool you. The final step ascent to Royal Arch involves many switchbacks and steep hiking. 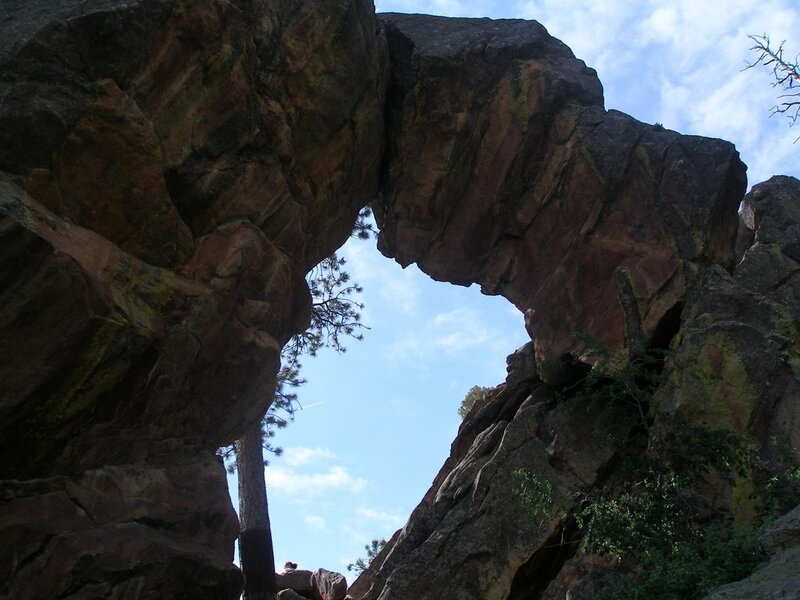 The Royal Arch itself is not like those around Moab, but is cool nonetheless. Check out the picture. I did have great views of downtown Denver. I hiked back down to the top of the switchbacks and left the trail in search of Fern Alley. I climbed up the north side of the fourth Flatiron, but I'm not sure I ever found it. I did a bit of boulder scrambling, crossed the top of the fourth, and then started back towards the trail. About halfway down I found a nice scrambling rock that had slings on some trees. 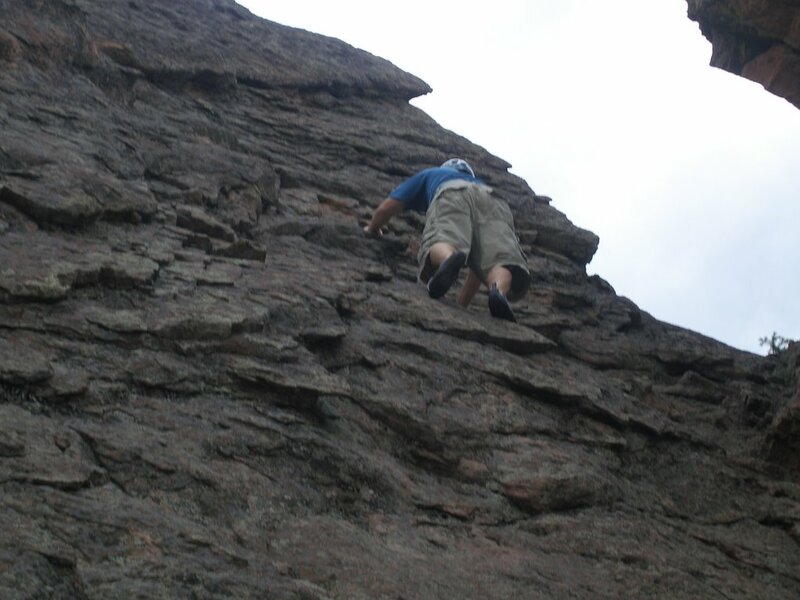 I donned my climbing shoes and gave it a go. It was the perfect challenge on the climb up and I had quite alot of fun. 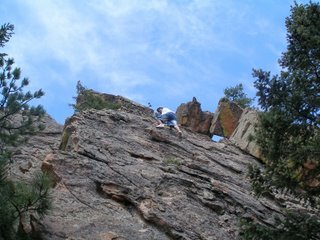 I climbed along the shelf at the top of the slab until I could not go any farther. This forced me to downclimb about half of the route. Luckily there was a nice crack, but it was still a nervous time. At the bottom I was relieved and very happy. Quite a fun day. 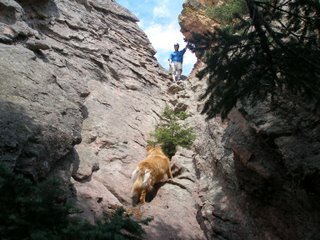 Gracie and I went for a hike to the Mallory Cave in the FlatIrons above Boulder. I also wanted to do a bit of scrambling. 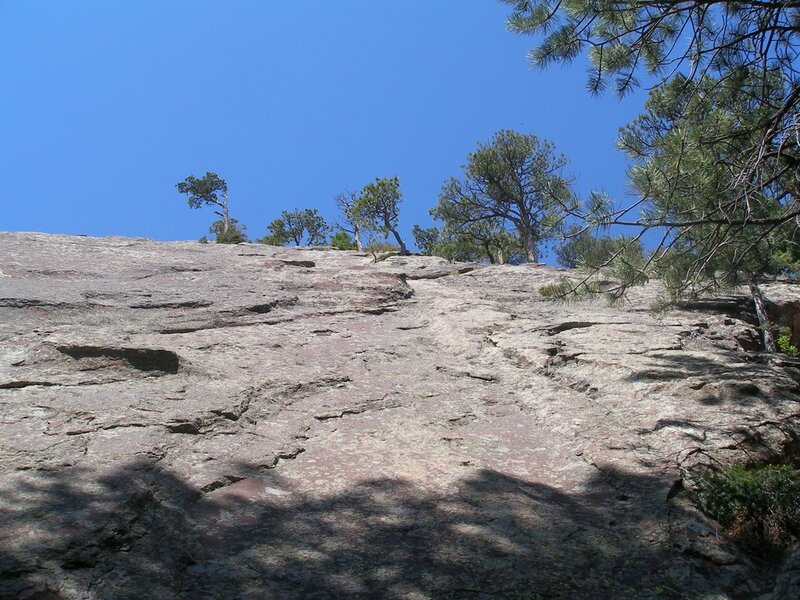 I found a great little book in the library called Flatiron Classics: A Guide to Easy Climbs and Trails in Boulder's Flatirons which describes many cool climbs that nobody knows about. This was my first hike in the Flatirons and I must say I was very pleased with the area. It is a very beautiful and peaceful place so close to Denver. Once we got to the cave we found that the area is closed until October so as not to disturb the bats. I guess we will return in October! Here's a picture of Gracie trying to scramble... she whined so I had to help. With the first goal unattainable, Gracie and I headed on up the trail to look for a nice rock to scramble on. 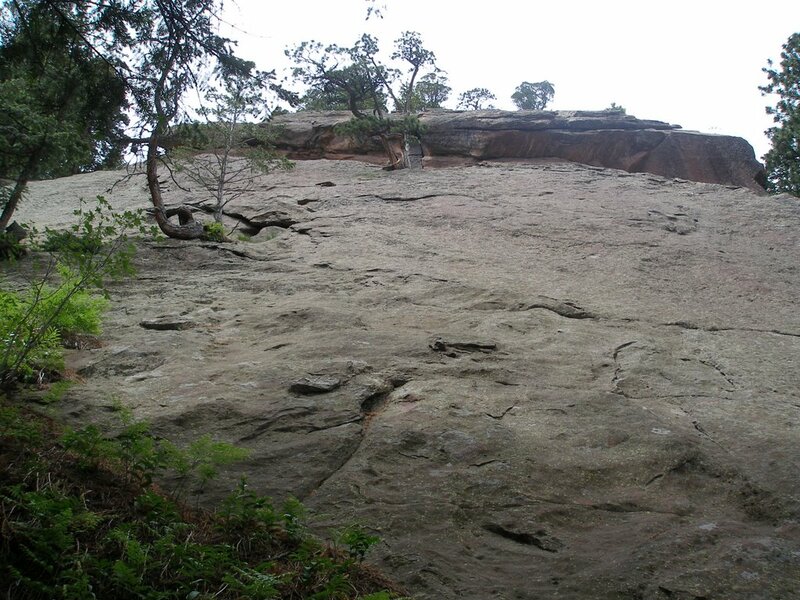 At the top I found a nice rock and slipped on my climbing shoes. Check out the photo. I was scrambling up a section that was at the edge of my comfort zone, when a couple of hikers approached our area. Gracie was not on a leash and was starting to whine because she couldn't see me. 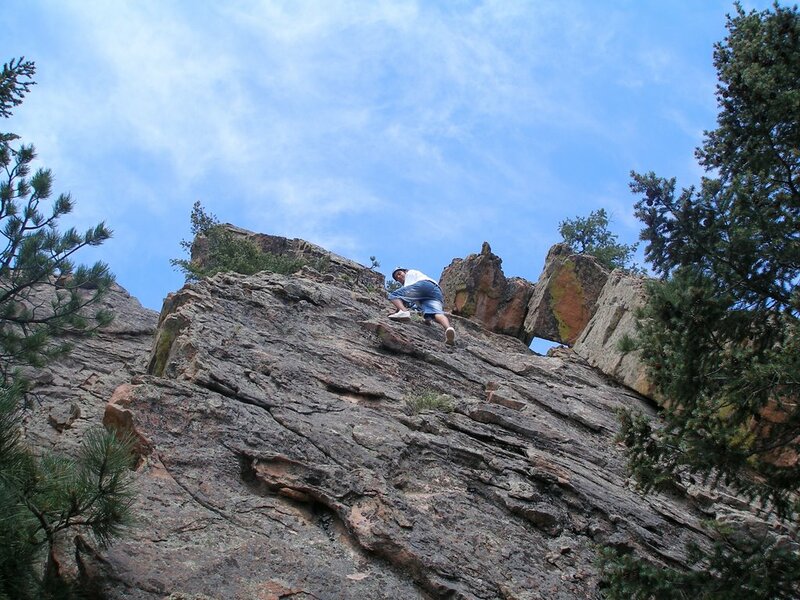 I couldn't move down the rock quickly, so I had to scramble up instead, swing from a small tree into a crevice so I could get down and collect Gracie before the hikers approached. Quite a n adventure.